Remote ready Luminara Candle measures 4 x 9 inches. 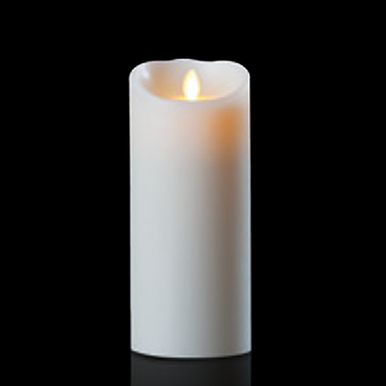 Ivory color wax candle with remote control chip and timer feature. Remote control is optional. An internal LED source shines through a prism and up to the flame tip. The flame moves creating dance like motion that is stunning and so realistic. 3 position switch on the bottom of the candle: Off - On - Timer. In the full On position the remote control is active. Remote is sold separately.